An Absecon Police Officer was suspended and required to surrender accrued time off as part of disciplinary action for making inappropriate comments to another police officer. After a six-month long investigation and multiple Open Public Records Requests, it appears only one member of the Absecon Police Department, according to the documents released by the City, matched the description of the employee that received a 30 working day suspension and surrendered accrual time to the equivalent of approximately $12,000. 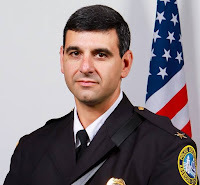 It appears that individual was Chief of Police John DeRitis, Jr.
DeRitis, who worked 8-hour days at a pay rate of $58.6536 per hour, while out for the 30-days unpaid, lost approximately $14,076.91 in salary. According to the City of Absecon, the same officer that was disciplined for 30 working days also surrendered personal, vacation and compensatory time as part of the discipline. An accrual report released by the City also shows between July 3rd and July 18th, 89.50 hours of compensatory time, 24 hours of personal time and 91 hours of vacation time was removed from DeRitis' accrual records equaling $11,994.66; the approximate $12,000 the City indicated. DeRitis joined the Police Department in 1998 and moved up in rank to Lieutenant in March 2012 until his appointment as Chief of Police on February 1, 2015. As disciplinary records are considered personnel records and exempt from release to the public, other documents were public records including a Public Synopsis of Disciplinary Action as required by the Attorney General which provided details of the disciplinary action taken and reason for the disciplinary action. It is unknown as to what the context of the inappropriate comment was or to which officer the comment was made as those records are not permitted to be released by the City of Absecon. 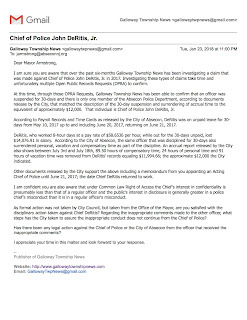 Galloway Township News reached out to Mayor John Armstrong requesting comment on the disciplinary action and what action the City has taken to assure the same incident does not occur. Mayor Armstrong replied stating he would respond to our inquiry shortly, but also requested the identity of the author of the article. 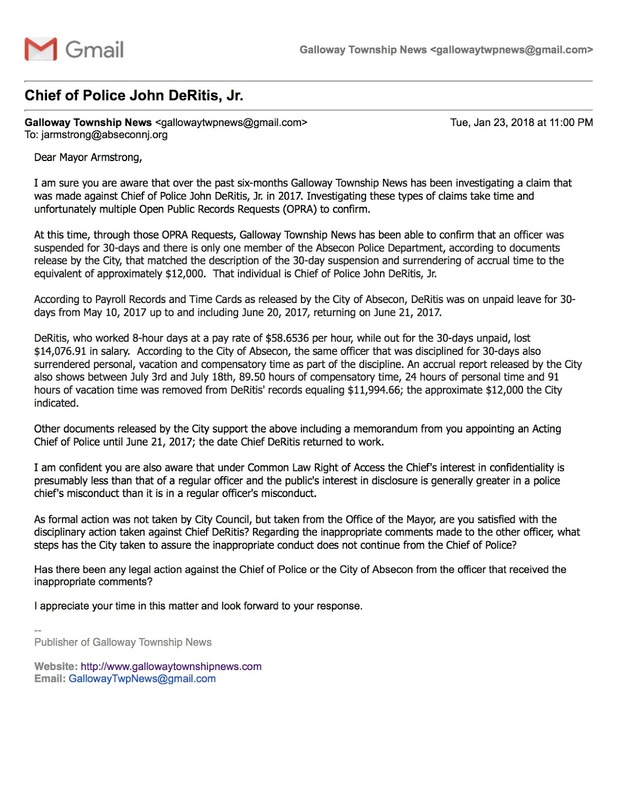 Galloway Township News provided Mayor Armstrong with the identity of the publisher. Mayor Armstrong stated, "By responding to your email communication of January 24, I do not intend to confirm or deny the existence of any claim against any City employee. I am aware of the release of certain information through OPRA requests which you have made recently." Mayor Armstrong further stated "The laws governing the release of such materials are quite complex, and the City has relied upon the advice of legal counsel to assure that we maintain the appropriate balance between the interests of the public to be informed as against the rights of privacy of any individual complainant and any individual who may be the subject of a complaint. After consultation with the City’s legal counsel, I must advise you that I am legally constrained from responding to the questions which you have raised in your communication." *Documents released by the City of Absecon are provided as links within the story.